Tower of India is a one kilometre tall mixed used super tower comprising of residential apartments, hotels, offices, urban farms, sky park, museums, shopping mall and concert halls. 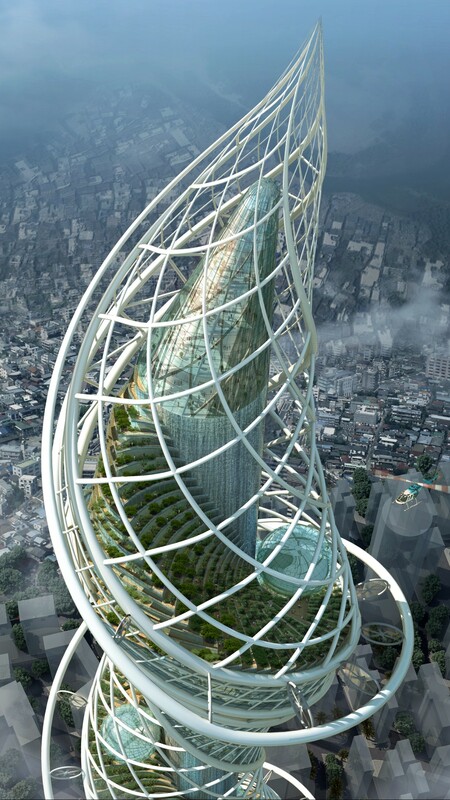 Situated in the Wadala District of Mumbai, the design was invited by the Mumbai Metropolitan Regional Development Authority (MMRDA) to achieve the world's tallest tower in India and also as a new vertical urban district without the need for sprawling road networks. The tower is engineered with a spiralling paddy field landscape that increases the green vegetation of the site by ten times and act as a wetland recycling ecosystem for the tower, as well as the world's largest wind farm on a building to supplement its electricity needs.